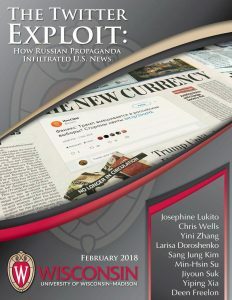 A research team led by SJMC Ph.D. student, Josephine Lukito, and associate professor in the SJMC, Chris Wells, released their study Thursday, on how popular mainstream and partisan news outlets used Russian-backed tweets in their stories beginning in 2015. The study was also highlighted in the Columbia Journalism Review. The research study specifically looked at how mainstream and partisan news outlets, such as the HuffPost and USA Today, used tweets with ties to Russia when they wanted to illustrate “current opinion.” Most of these tweets came from Twitter accounts connected to the Internet Research Agency, a St. Petersburg-based organization that is directed by individuals with close ties to Vladimir Putin and that has been linked to Special Counsel Robert Mueller’s indictment of 13 Russian agents last month. After searching the content of 33 major American news outlets from the beginning of 2015 to September of 2017, Lukito and Wells found that stories with IRA tweets appeared in mainstream news and the bulk of tweets with IRA ties occurred after, and not during the 2016 presidential election. One of the most surprising findings was that only five percent of the stories that included tweets from the IRA were about the election. Instead, a majority of the stories that included these tweets centered on hot-button social and political issues such as racism and healthcare. For more on how popular news outlets used Russian-back tweets in their stories to express stereotypical partisan opinions, please visit the Columbia Journalism Review’s website. Feedback, questions or accessibility issues: webmaster@journalism.wisc.edu.